A Backpack is an all-important essential item to any trail, mountain or ultra runner. Because of the variables we encounter when out running the need to carry ‘essential’ items, food and water mean that a practical and comfortable pack is essential. Now if you are like me, I am sure you will have spent a fortune on constantly trying to find that ‘perfect pack’. We have so many variables to consider and I personally find that no ‘one’ pack does all jobs well. The Aerios 7L (also 10L available) weighs in at 400g and comes in either black or blue. It has two internal pockets; one for a bladder and the other pocket is a small zippered type with a key holder that could hold a wallet, phone or both. 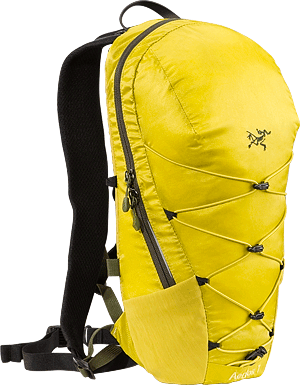 It is a simple pack that can hold a surprisingly large amount of kit. In the test case I had a buff, gloves, head torch, Incendo Jacket, Incendo Vest and 2 collapsible poles inside and I still had plenty of room for additional kit. On the outside is a drawstring elastic cord with a ‘garage’ to stow excess cord. This elastic is ideal for adding a jacket such as the ‘Gore Tex’ Visio FL. It has an elastic waist belt with a ‘quick release’ adjustable buckle and if required the waist belt can be removed from the pack completely with two fasteners. On the chest it has an adjustable chest strap that can be placed in one of four positions depending on your body shape and desired fit. In use it is really comfortable to wear and has minimal bounce. The rear of the pack has ‘Aeroform’ mesh that provides a stable support and minimal heat retention. At the bottom of the pack on either side are two small expandable mesh pockets that are easy to reach without removing the pack and can easily hold several gels or food. At 7L it has a particular use and for me I personally would like the addition of pockets on either the shoulder straps or waist belt. This would provide more options for food and or other essentials such as mobile phone or GPS.